Size: 15.8 x 24.0 c.m. This is a book about the discipline needed to become and remain number one. It’s based on five years of research and practice conducted with CSC index, the fastest-growing management consulting firm in the world. CSC Index launched a business revolution in 1993 with the publication of Reengineering the Corporation, by Michael Hammer and James Champy. That book, a bestseller around the globe, advanced a set of ideas about how companies can redesign the way they do their work. This book, The Discipline of Market Leaders, will change the way business leaders think about what work their companies should do. Reengineering the Corporation was about how to run a race. 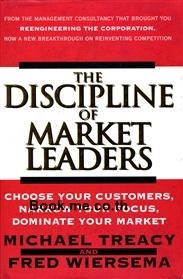 The Discipline of Market Leaders is about choosing the race to run.